Drawing on clinical data obtained through the study of children adopted from overseas orphanages, the author of this cutting-edge text applies the Developmental Trauma Disorder (DTD) conceptual framework to the analysis of psychological, educational and mental health impact of the early childhood trauma on development. A massive scale of international adoption of children, victims of profound neglect and deprivation, combined with the fundamental change in a child's social situation of development after adoption, offers a valuable opportunity to explore the concept of Developmental Trauma Disorder, in particular, developmental delays, emotional vulnerability, "mixed maturity", cumulative cognitive deficit, and post-orphanage behavior patterns, being presented by many adoptees long after the adoption. By focusing on the neurological and psychological nature of childhood trauma, Dr. Gindis offers a unique approach to understanding the ongoing impacts of DTD and the ways in which any subsequent neuropsychological, educational, and mental health issues might be assessed. 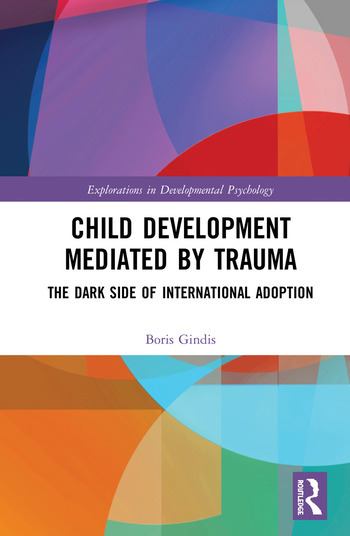 Offering an evidence-based exploration of DTD, and a critique of "conventional" approaches to rehabilitation and remediation of international adoptees, this book will be of great interest to researchers in the fields of psychology, mental health, education and child development; as well as clinicians involved in trauma treatment and international adoption. Appendix 1: Developmental Trauma Disorder Questionnaire for the Parents of Internationally Adopted Post-Institutionalized Children. Appendix 3: Sample of referral questions and psychoeducational tests/clinical procedures used for a comprehensive combined neuropsychological, developmental, and educational assessment of Internationally Adopted Post-Institutionalized Children. Boris Gindis, PhD, is a licensed psychologist, USA.